First of all, space is at a premium when it comes to constructing closet systems and bathroom cabinets for your lifestyle. Whether you’ve just moved into the house or decided closet remodeling, it’s time for a change and a few upgrades – start with a plan. Today’s interior designs offer closet remodel projects a customized look to enhance and add value to the home. The design themes range from modern, traditional or eclectic concepts to fit the home’s personality. It’s the right time to meet with a professional designer to talk about your closet ideas and visions. Planning is an important part of the creation for both of these new designs. The size of the home doesn’t always make a difference. These projects both share common layout issues. Designers pay attention to the arrangement of the closet systems. They also focus on the placement of the bathroom cabinets. The challenge is to keep the design rules simple. Consequently it’s done by using proven layout strategies to double the use of available space in the area. Keep in mind there is no perfect template for a closet system or a bathroom remodel. The differences are a result of the project being designed around the household. As a result the final build-out is based on the available space and budget. Our professional designers and experienced installers are using design standards and industry guidelines to accomplish closet remodeling projects. Furthermore, the purpose of these methods is to enhance the home’s environment and renovate order. Our planners begin the project with accurate scaled drawings of the usable floor space. They’re listening and taking note to include your chosen features. Every single design consideration is reviewed to avoid common pitfalls. Finally, the closet remodeling project takes form with as little interruption as possible to daily life. The materials used are industry brands. They are known for excellent craftsmanship, high quality and customer satisfaction. Choose from one of the cabinet design themes and create your own custom closet style. This is the most common type of closet, often serving as storage for linens in a small hallway space or in a children’s bedroom. Despite the smaller scale of the closet space, there is no reason to compromise on style. Sliding or bi-fold doors are common with a large opening. However, your new closet remodeling design can utilize popular barn doors on a sliding track. The walk in closet is highly sought after in houses of all sizes and offer space for custom closets with more functionality and style. Regardless of their larger size, wasted corner space or poorly placed closet rods may not be meeting your closet needs. Shelves at undesired heights also waste valuable closet space. Walk in closet layouts with clothes hanging on both sides as well as on the back wall results in closet rods having to overlap at the corners. This leaves empty space and is a poor use of the area. A better option is a wall of drawers, which can free up space in the bedroom area by removing the need for large storage furniture like dressers and armoires. Another option is a wall of shelves for folded sweaters, shoe and purse storage. You may divide the wall in half and incorporate the use of drawers and shelves. When making space for shoes, keep in mind the shelving height for boots and high heels. 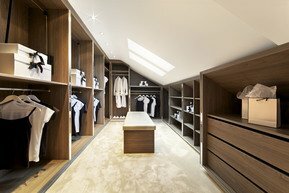 Master closets often incorporate high-end and luxury features due to their larger size and opportunities for custom closet design and space. One popular feature of a dream closet is a center island. If space allows, drawer can be included in the island. But if there is not sufficient space for the drawer pullout, shelves still provide a wise use of the design. A high-end design does not stop at shelves and closet rods. Most of all, the finishing touches personalize the area by incorporating lighting, decorative drawer pulls and hardware. In addition glass inserts in doors, and color choices beyond the typical wood grains or painted white. The addition of a bench provides a place to sit and put on shoes while providing further design and style. If there is a window in the space, rather than avoiding the area around it, make use of it by installing a window seat with storage. The master closet is an extension of the bedroom and master bathroom retreat. Therefore, the possibilities are endless for custom closet designs and special features. A closet remodel provides the opportunity to add style and improved functionality to your storage space. Not all storage areas will be custom closets, but every area should fulfill your closet needs. 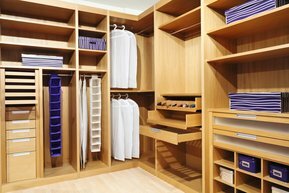 From closet organization systems to unique hardware finishes, Cabinet Genies have a wide variety of closet design ideas to help you achieve your dream closets.